The Kramer VS-88UT is an all-in-one 4K@60Hz (4:2:0) Audio-Video presentation system with integrated range extension and an integrated control system master. The unit switches the video, embeds the audio and outputs the signal to both an HDMI and an HDBaseT 2.0 with USB extension and PoE on the HDBaseT output ports. Outstanding audio support includes balanced stereo audio, unbalanced stereo audio, and de-embedded audio sources that output to embedded audio, balanced stereo audio as well as a power amplified audio output. 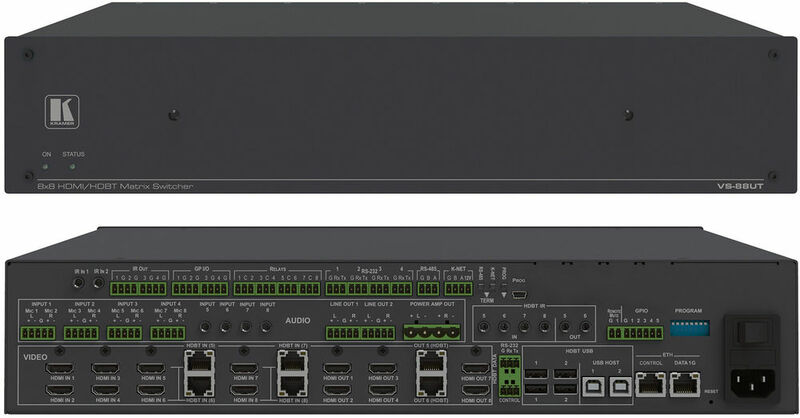 VS-88UT includes a master room controller that can operate over Ethernet (LAN) with control ports that include: one bidirectional RS-485, four RS-232, four IR, four GPI/O, and eight relays to control a wide variety of AV devices. It includes a KNET™ connector interface that enables access to the master controller from auxiliary room controllers such as control keypads. The unit can also provide power to auxiliary room controllers via the KNET™ connectors. VS-88UT includes an Ethernet gateway to control and manage remote I/O ports. Max. Data Rate - 10.2Gbps (3.4Gbps per graphics channel). HDBaseT Certified - V2.0 support. HDBaseT Extension Reach - Up to 100m at 4K @60Hz (4:2:0), up to 130m (430ft) at full HD (1080p @60Hz 36bpp), up to 180m (590ft) at ultra-mode and full HD (1080p @60Hz 24bpp). For optimum range and performance, use recommended Kramer cables. USB Support - USB 1.1 & USB 2.0 (up to 127Mbps) channeled through HDBaseT. HDMI Support - Deep Colour, 3D, 7.1 PCM. Control Options - RS-232 serial commands transmitted by a PC, touch screen system or other serial controller, Ethernet port via LAN. Kramer K-Config™ Compatible - Windows based control program with easy configuration and upload to room controller over customer IP network. Kramer Network Compatible - Remote control and management over customer IP network. Simultaneous IP Control Communication - With up to 15 IP control clients. Auto-switching and Auto-scanning of Inputs. Audio Breakaway and AFV (audio-follow-video) Operation Support. Global Mute for Both Video and Audio Outputs - Allowing easy integration of the audio system with a public announcement audio system in case of an emergency event. Includes non-volatile memory - Retains the last settings, after switching the power off and then on again. 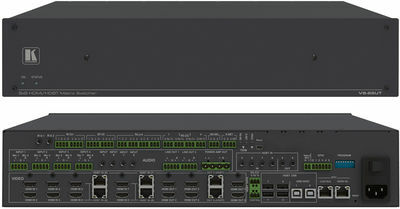 4 HDMI and 4 HDMI/HDBaseT (selectable) Inputs. Audio Inputs - 4 balanced stereo audio inputs or 8 microphone inputs (selectable) as well as 4 unbalanced stereo inputs. 6 HDMI and 2 HDBaseT Outputs. Audio Outputs - 2 line-out balanced stereo audio outputs and one audio amplified output. USB Ports - 2 USB type-A hubs and 2 USB Type-B ports. 6 IR Ports - For HDBaseT tunneling. 1 Ethernet Port - Connects to control gateways for I/O port extending, and controls IP-enabled controlled devices. 1G Ethernet Port - For tunneling data via HDBaseT ports. 1 K-NET™ Connector - Carrying both power and control communication; connects to room control system, either master room controller, or auxiliary control keypads. 1 RS-485 and 2 RS-232 Bidirectional Control Ports - Control devices via bidirectional serial control protocols. 4 IR Emitter Control Ports - Control devices via IR control protocols. 4 GPI/O Control Ports - Control devices via general purpose I/O ports, program-configured as digital input, digital output or analogue input interface for controlling sensors, door-locks, audio volume and light dim level, or lighting control devices. 8 Relay Control Ports - Control devices via relay contact closure, such as scrolling up and down screens, drapes, shades, and blinds. IR Sensor and IR Input Ports - Learn commands from IR remotes. Product Weight 3.9kg (8.6lbs) approx. Shipping Weight 5.4kg (11.8lbs) approx.